We had a wonderful turnout for our Community Sunday activities today. In fact, with well over twenty plotters and volunteers there, this was our biggest ever February Community Sunday. What a start to the year! 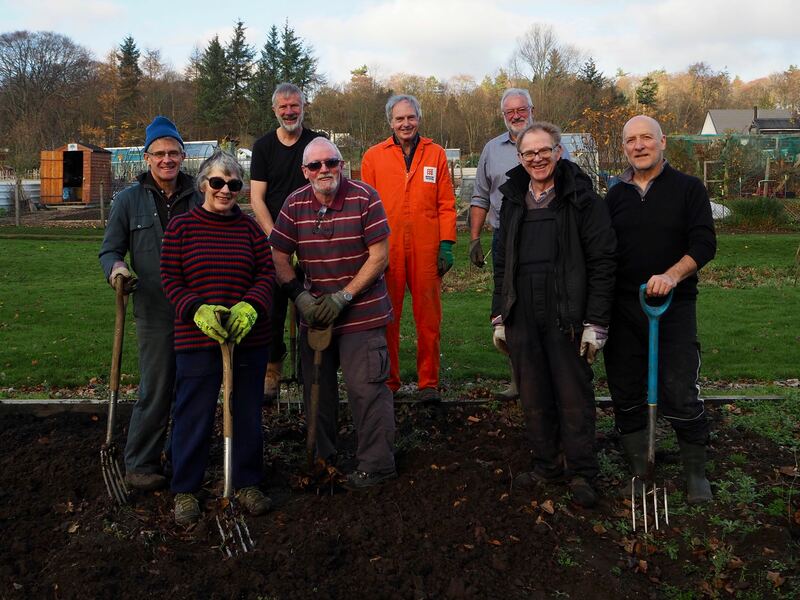 With so many willing hands available we got a wonderful amount of work done around the site – weeding, pruning, bonfire prep, pothole filling, litter collection and much, much more. A huge thank you goes to all who found the time to come along and to all who contributed to a magnificent coffee and cake spread. There was no room at the inn for the old lag’s club. It’s 2019 and GFAA is stepping up a gear. 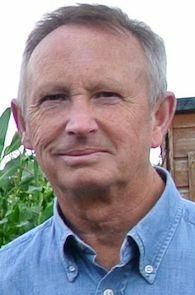 May I wish all of our plotters, volunteers and friends a very Happy New Year and a successful growing season. 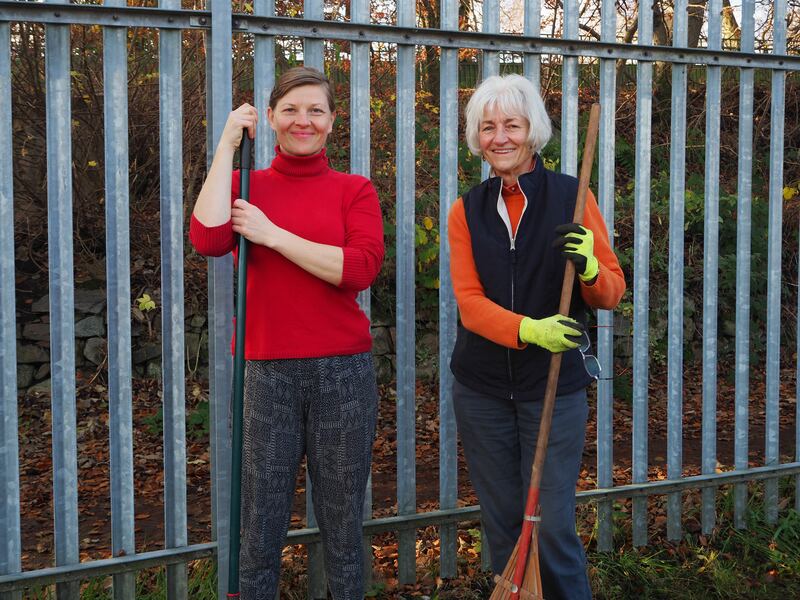 Since 2014 Garthdee Field Allotments Association has participated in the IT’S YOUR NEIGHBOURHOOD campaign run by Keep Scotland Beautiful. 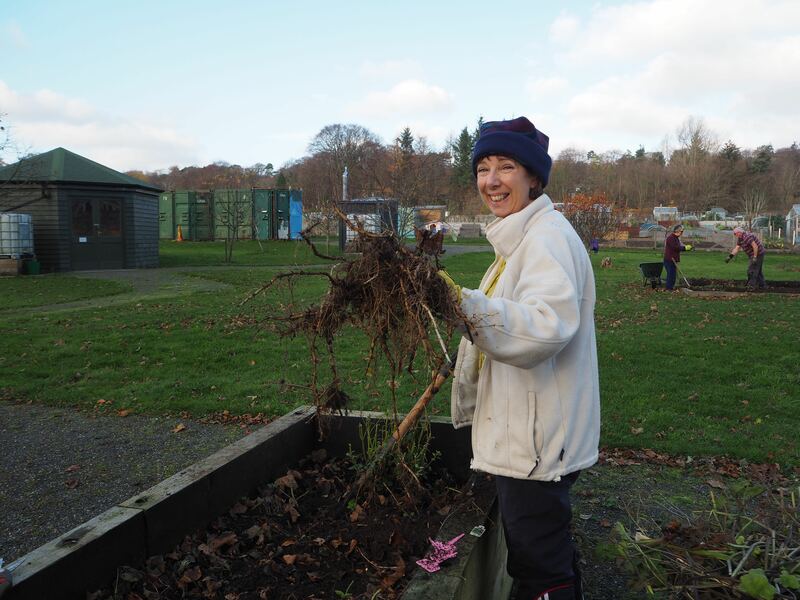 Over the past four years we have gradually improved our site environment, consolidated our community activities and improved our gardening achievements. As a result of everyone’s efforts we have been awarded the highest level of achievement for three years in a row and are encouraged to raise our standards further by applying for a GREEN FLAG AWARD. The green flag award applies to parks and green spaces throughout the UK and our allotment site falls into the latter category. The closing date for applications is the end of January each year and the Committee’s intention is, that over the next 12 months we make the necessary preparations for an application in January 2020. We will shortly be making plans for activities and work on site to achieve our aims and the Committee hope that as many plotters as possible will support this project. There is no guarantee that we will be successful but we’re planning to give it our best shot. If you want to find out more just speak to any of the Committee. I am delighted to say that The Market Stall Team (TAMS) have told us that GFAA has earned a dividend of £399.23 across the 2018 season. This will make a very welcome contribution to our Association’s funds over the coming year. TAMS have ambitious plans for the season ahead. 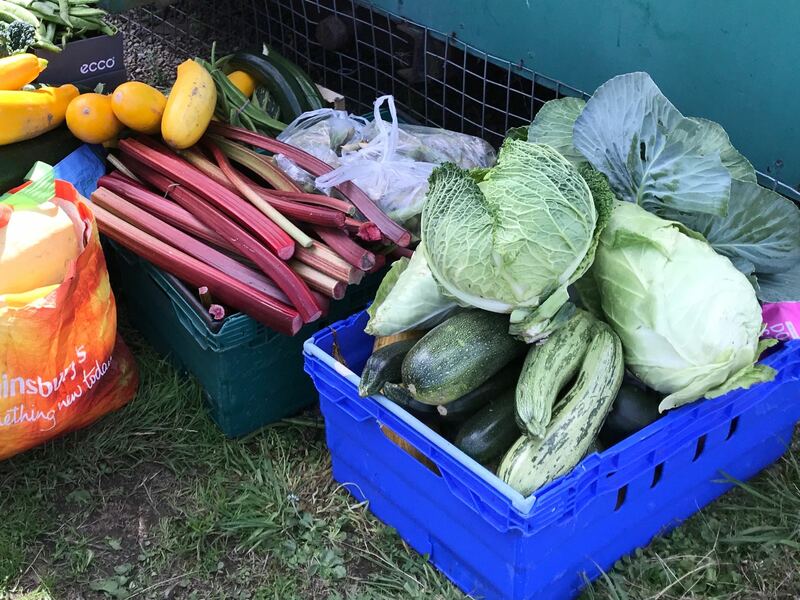 They want to continue the process of becoming more sustainable in the longer term and are looking into the possibility of setting up a community greengrocer shop, which they think in the long term might generate a small profit to pay for the stalls. They have also put in for funding to set up a new stall in Victoria and Westburn Parks to run along with the others in Duthie and Seaton in 2019. We are very pleased to support TAMS’s efforts in their fight to reduce food waste. Working with TAMS is a win-win for us as they help us manage our surplus crops and help generate very valuable funds for projects and maintenance around our site. Thanks to everyone who contributed. A big thank you goes to all of our plotters who found the time to turn out for our last Community Sunday of 2018. It was super to see 24 on site with a combination of new faces and old lags. 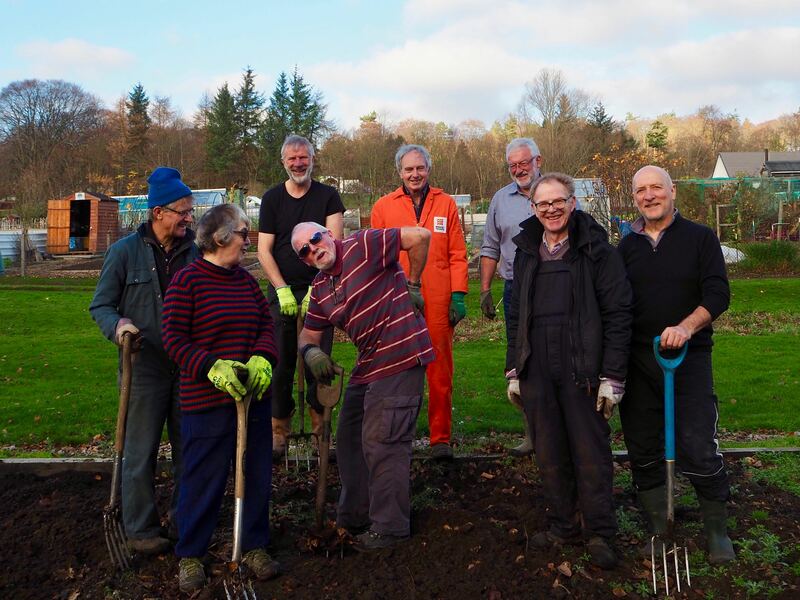 With so many willing hands we got through a mountain of seasonal tasks, including a wonderful tidy up of the Primary Plot and raised beds, South Bank planting, lots of leaf gathering and pothole filling. Of course, you can’t have a Community Sunday without a resident comedian: this time thanks go to Ron (Plot 65A). I think we can say, a good time was had by all. Thanks again, everyone. (With apologies to Peter, Jacqui, Helen, Stan, Angela, Gavin, Trish, Norman and Mary who somehow missed out on getting their photos taken. Thanks too, to all of the magnificent bakers for a brilliant spread at Coffee and Cake time. We are hoping for a bumper turnout this coming Sunday for our last Community Sunday of the year. 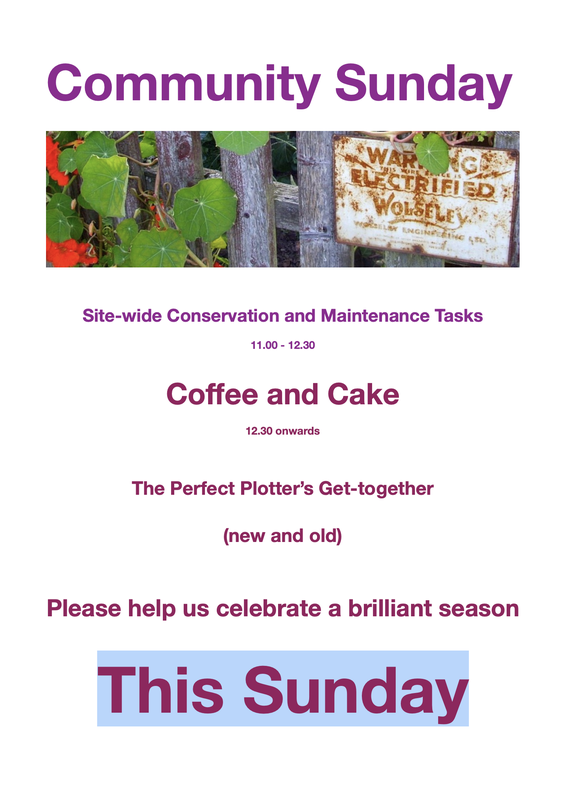 It will be a chance to meet our new plotters and volunteers, celebrate a season full of successes and prepare our site for the winter ahead. Please come along and give us an hour or so of your time if you can.